Interior Tech is a specialty contractor with a focus on fire/smoke/egress design, glass, acoustic operable partitions, space division alternatives, and security. They had an old website that needed a redesign to make it more accessible for their clients and to highlight their vast array of products. Ritama Design created a site with an easier navigation menu and better division of information on the Home page to assist the viewer in getting to the product(s) they were interested in. Visual images are paramount in describing the products that Interior Tech offers! Each detail page of every product has a gallery of images and many also have videos or gifs to see the product in use. PDF downloads of the specs are also available on the detail page of the product. 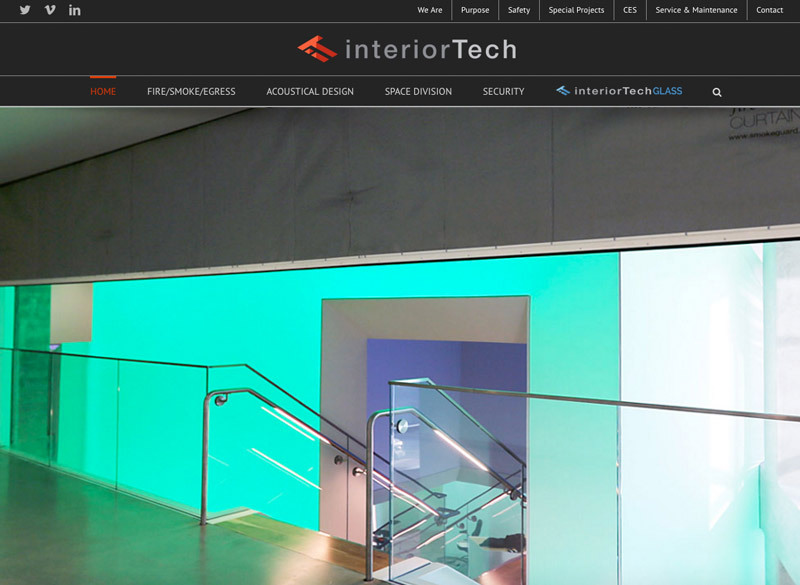 Interior Tech is a complicated site and required creating many short video tutorials about each section to aid the company in updating the website on their own. Ritama Design routinely provides tutorials for clients and gives them a video of the session(s) to keep and refer to after the site is launched. “Like most companies, we had some strong ideas about what we wanted in our new website. Ritama respected these ideas but also made it a lot better. I liked the way she would give us 2 or 3 options for a certain page, all of them good. We needed it to appeal to the design community but also to the rest of the construction industry, and she accomplished that.